Last Saturday, I saw Angono National High School (ANHS) again on tv. It was another report on how the people living very near Laguna de Bay is coping with the flood brought by typhoon Maring. ANHS, the largest high school of Angono, Rizal also serves as the most frequented and largest evacuation center for hundreds of families from the barangays of Kalayaan and San Vicente. Every year since I’ve known the town, I will see them in the news and it was just either because of Higantes Festival or because of flood. I was reminded all of a sudden that there was a time, that everyday, that town is all I think of, literally! I scanned the people at the reporter’s background looking for some familiar faces of people I possibly had interacted with during those three years I spent working in Angono. I suddenly remembered the same scenes of August last year. The people were in the same situation, it seems. Unlike last year, though, when I even attended the municipality’s meeting for disaster prevention and relief contingency, I am not so sure of the extent of the damage and to how many families are affected. 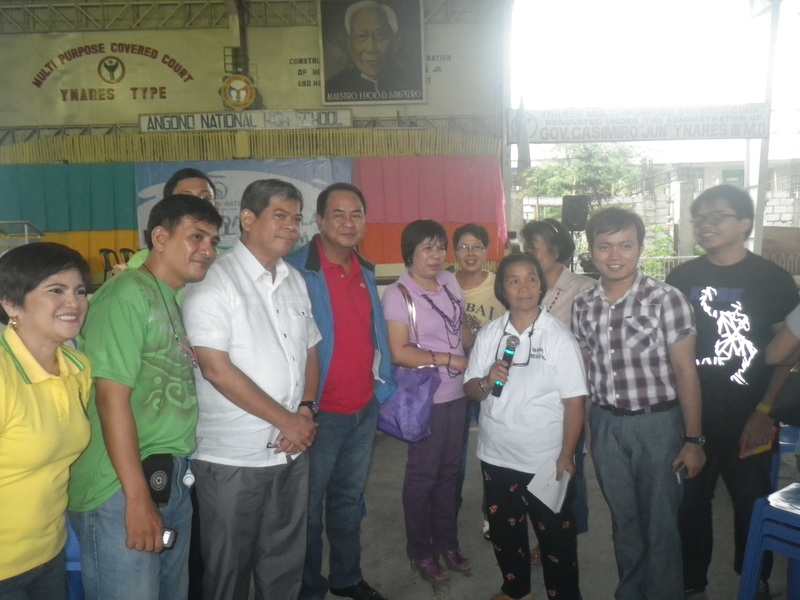 Mrs. Cynthia Cruz, ANHS principal and my “kasangga” (third from right) poses with other school teachers with Mayor Gerry Calderon and Deped Undersecretary(fourth and third from left respectively) in one of the Brigada Eskwela events on June, 2013. School teachers assist students and evacuees alike during times of calamities. I know very well that last year’s Habagat is still being endured by the people until now. One of my unfinished businesses in my previous job is to see to it that those who had spiked-up water bills because of damaged water pipelines get some “Habagat assistance”. One prominent case I can still remember is that of an old man living by the community in the lakeside. He lives by himself and works part-time in the municipal hall for a living. From his monthly water bill of 8 cubic meters (averaged), his consumption suddenly spiked up to 1,200 cubic meters. This was when he went back to his house vacant after two months of stay in ANHS evacuation center. His case is much like the case of around 50 families in Angono last year. I hope the cases are not duplicated this year or that would be a problem too hard to handle by both the customer and the company. Back in 2009 when Ondoy happened, the affected families were able to get “Ondoy Assistance” where some percentage of their high bills were deducted. For last year’s Habagat, I submitted the list of accounts attached with the necessary documents and certificates. If the financial assistance was granted by the top management, I may never know. Until my resignation there was no positive response yet. Consider this me vindicating myself but I guess I just want to say that I did what I could when I should. Back then, whenever it rained, I had to text my benchmark customers or “kasanggas” to check their situation. Did they evacuate already? Where? Do they need water tankers? For around how many headcount? Are there busted pipes in our network or in theirs? Were the classes/work suspended? I made friends in that Lakeside Community. The most genuine, most appreciative customers I had, I found in the many “Samahan” or group of people’s organizations. I texted my “kasanggas” though I know I cannot be of much help anymore. It’s nice to read their replies telling me they are fine and asking me how I am, too. Some replied, “Hu u?” but that’s okay, too. Cellphones, in my experience whenever I tried to contact them, turn out to be shared among family members. One of the kids might be using the cellphone that time. I miss them. I’m an emotional kid inside and large amount of the immeasurable tears I cried when it was time to say goodbye was because of the farewell words of Sir Jun Aguilar and Aling Connie, two community leaders of Lakeside. We had been through a lot – projects (or lack thereof), public conferences, a Korina Sanchez tv show, summons, complaints, etc. For the most part, I feel like they stood by me. Every time they bump into me in the municipal hall, the public market or anywhere on the road, they would tell me their concerns and would never fail to thank me each time, emphasizing that I serve as bridge to communicate their water needs. In turn, I learned a lot from them and the life they and their neighbors lead. They gave meaning to the hours I spent on field which otherwise could have been just aimless routine of roaming around. They touched my life by allowing me to touch theirs. I consider their prayers and well-wishes for me when I said I was leaving as a large chunk of my back pay. To remember people of Angono’s timeless mermaid fable. I wish whoever replaces me there will do a better job. I wish someday they won’t need the likes of me, meaning all their water needs are taken care of automatically. I wish they won’t need to set up evacuation centers in every daycare centers anymore. I hope someday the system will allow them to become fully self-reliant, self-enabling community. But if it’s too much, maybe as a start, I hope they won’t have to deal with flood with every high tide, and the problems which pile up as each storm come and go. Please keep moving, Angono. I know you will. Just this morning, I found out from the Unang Hirit that GMA Kapuso Foundation, Inc. is building multi-purpose halls in Angono, Rizal and Pandi, Bulacan. These are to be used as evacuation centers for these areas or if the weather permits, as recreational areas during better times.